That whole saying about “needing a vacation from your vacation” couldn’t be more true. My body is still in shock from having to do normal life again. My normal life involves eating leftovers while standing in my kitchen, drinking healthy juice (sometimes) and waking up early. Not to fool you, I don’t wake up early everyday because I’m a super productive person. I wake up early because I have a terror of an animal that thinks sleeping in is lame. Usually when I’m in New York it has something to do with work, so I’m generally running from meeting to meeting, getting lost, being rained on and being stressed. But last week it was completely different. There was so much leisurely walking, so much casualness, lots of wine with my lunches. Sometimes two lunches. Sometimes a late-afternoon cocktail. Whatevs! I was on vacation, man. And it was dreamy. I went to a lot of places. A LOT. Mainly because I date a maniac who loves food more than me. Seriously, I don’t understand how his body can eat as much as he does. And he’s super annoying because he eats everything and gains nothing. I went to so many places that I wanted to create a bit of a guide, documenting the places I went. I’m only sharing the stuff I loved. The first night was maybe my favorite meal. It was a splurge for sure, but we had planned it nearly a month prior so it wasn’t too much of a surprise when the bill came. Aska is in the back of Kinfolk Studios. The space is clean, minimalist and warm. 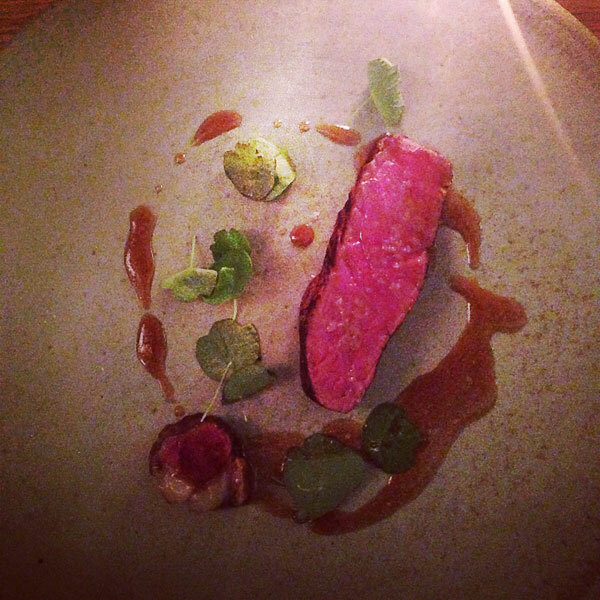 I’d categorize the food as modern—though, definitely not modernist—with roots strongly planted in Scandanvian cuisine. It was a beautiful procession of ten courses with a few bites and intermezzos sprinkled in between. The wine list was well-curated and the sommelier was enthusiastic, encouraging the tasting of everything that was on the menu (I love that!). The next morning we met up with some friends and headed to Their cookbook is a favorite of mine. It’s perched on my side table this very second. I sometimes thumb through it before bed and dream of making homemade pastrami. I headed to The Brooklyn Flea for doughnuts from Dough . I looked at some of the vintage knick-knacks, and like I had predicted everything was very well-curated and thus very overpriced. I was satisfied with stuffing my face with Coffee Cake and Coconut Doughnuts. Later on that day I went to the Wythe Hotel for drinks on the patio. It’s a beautiful setting, overlooking the water. And the bloody mary was on point. Dinner was at the pizza place, Paulie Gee’s. Hot honey pizza was my all-time favorite. And the was the perfect compliment: fresh tasting. Think a salad on a pizza. 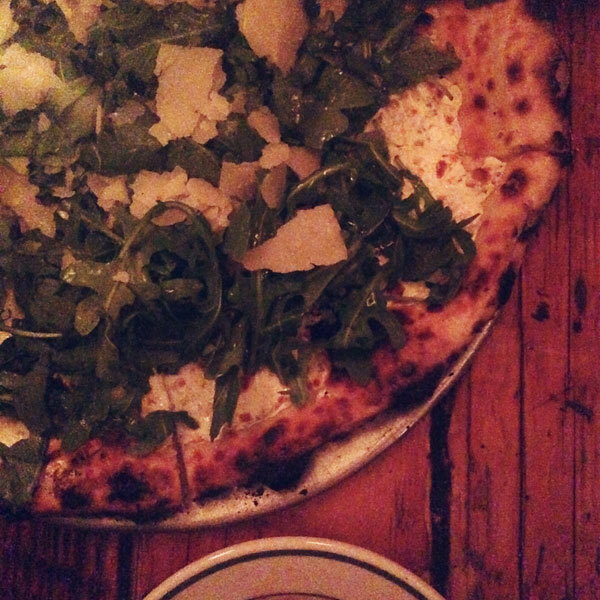 There were about eight more pizzas than the one pictured–it was glorious. The next day there lunch at M. Wells Dinette. It’s in a cool location, actually. Located within the MoMA, the restaurant space feels almost like you’re having lunch in an old elementary school where the nuns beat you or something—it’s a beautiful space! Their thing is meat. And foie. And lots of meat. Pictured is the Foie Gras and Oats, Tartare, Escargot and Bone Marrow, Testa Bean Hash (my favorite thing!) and of course, a Bloody Mary with a Smoked Mussel. Whut! 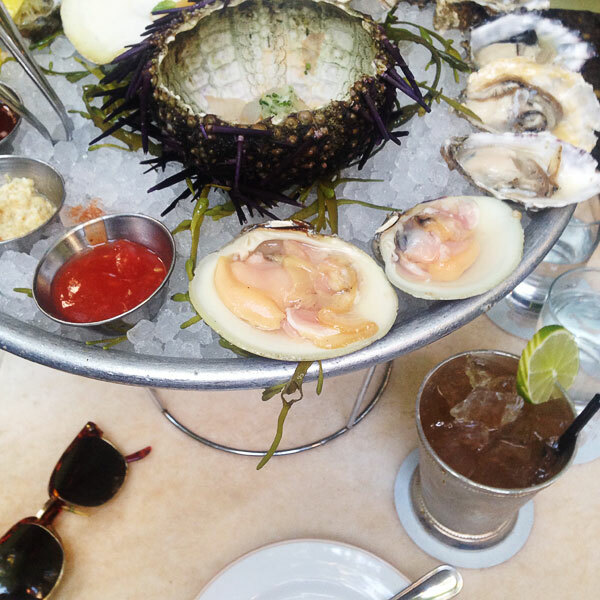 Before dinner, Josh and I went to Maison Premiere for their oyster happy hour situation. 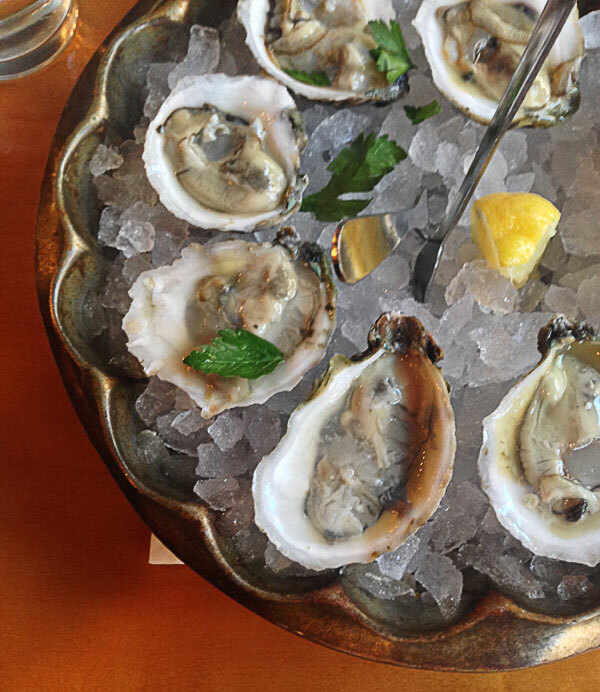 A dollar oysters…whaaaaat! In addition to the oysters, there was an uni ceviche and geoduck situation. They were good. Expensive but good. But the service…ooof. I will say the garden in the back outweighs the less than attentive service. 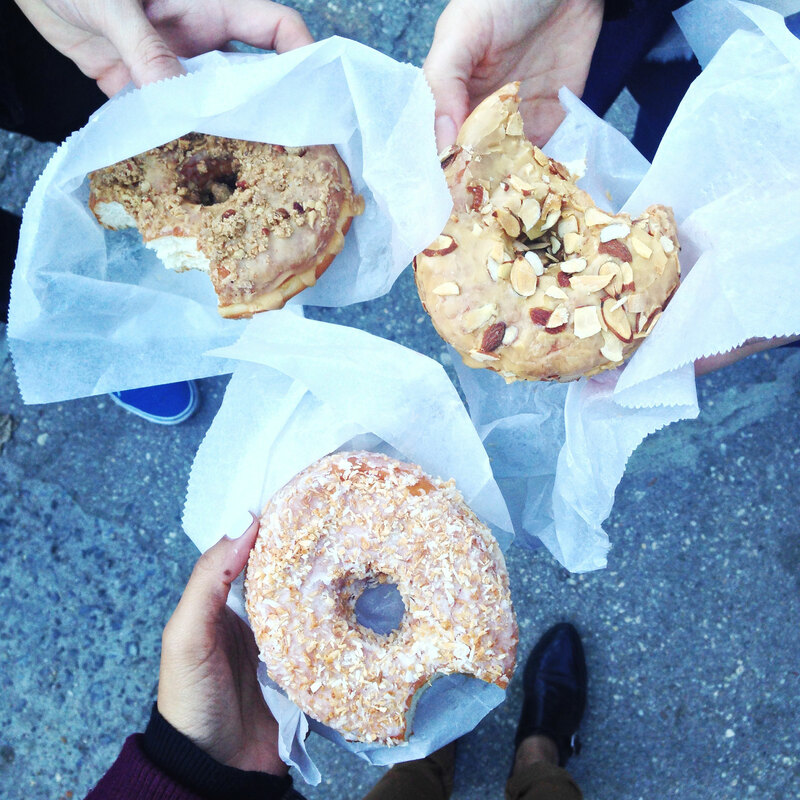 The next morning I went to the city to Dominique Ansel’s bakery…and not for the cronut. I mean, if they had the cronut I wouldn’t ordered it. Duh. But we went for the other baked goods which are BEAUTIFUL. 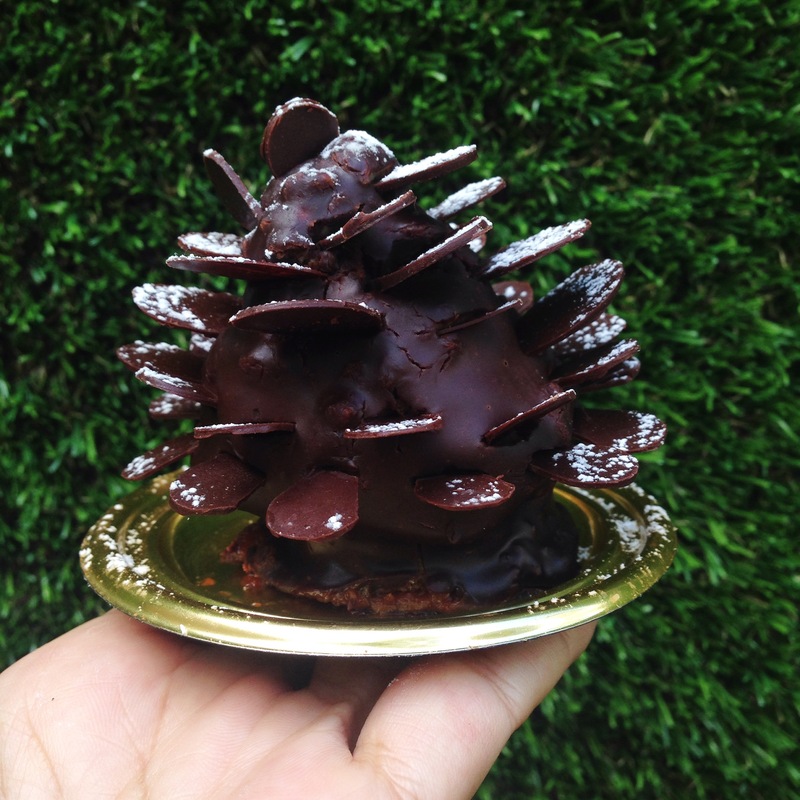 This pine cone was actually a gingerbread cake, coated in chocolate. Huh! Yes. 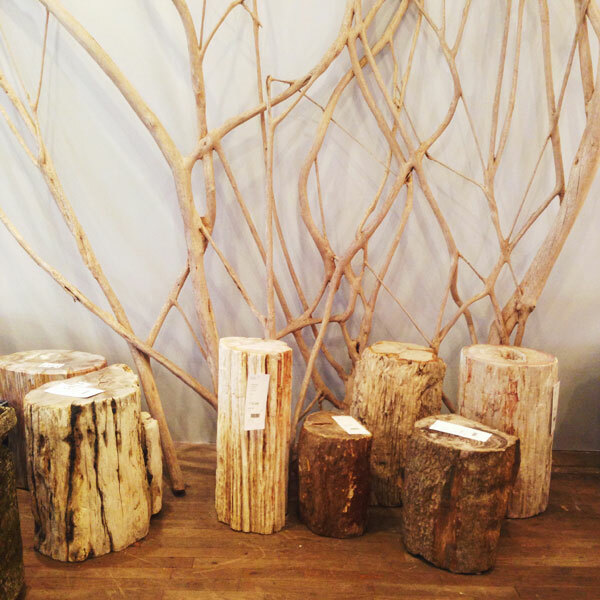 I went to ABC Kitchen and Home and stared at all of the twelve thousand dollar couches and wondered who would pay that much for something to sit on. But then I passed a few women who were picking out swatches for those twelve thousand dollar couches. They looked surprisingly pretty normal! 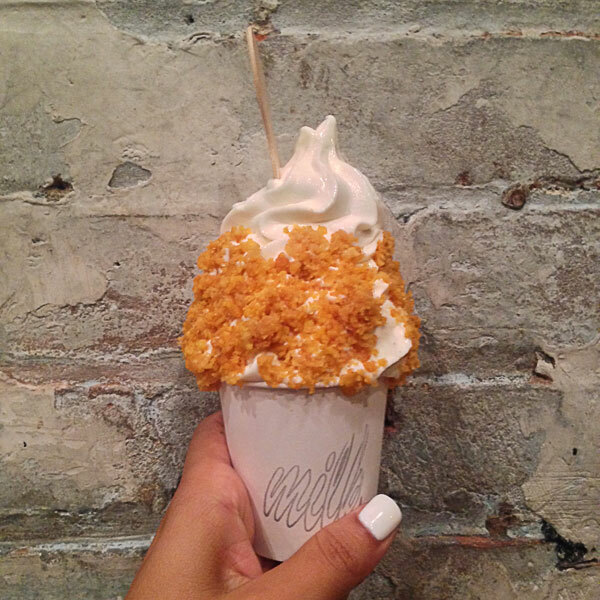 There was of course a visit to Momofuku Milk Bar for some cereal milk soft serve. 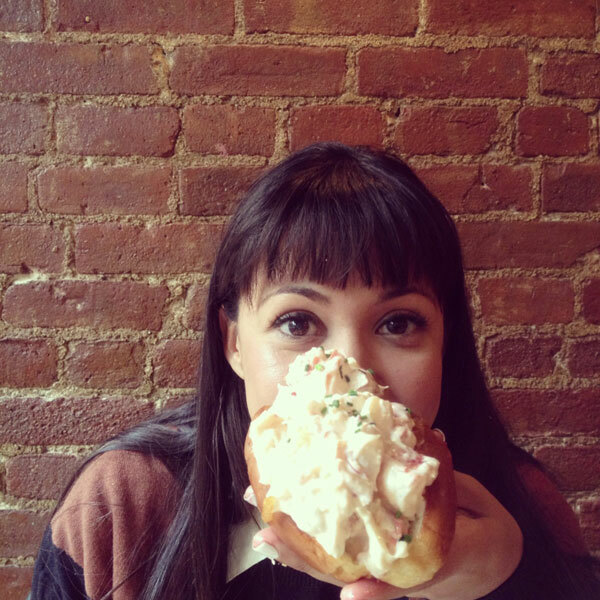 And then big gigantic lobster roll at Pearl Oyster! This was one of my favorite restaurants during the trip. The oysters were amazing but the real show-stopper were the steamed clams with the bellies still attached. It was the first time I had eaten clams with the bellies attached! The process was a little alien-esque but super cool! 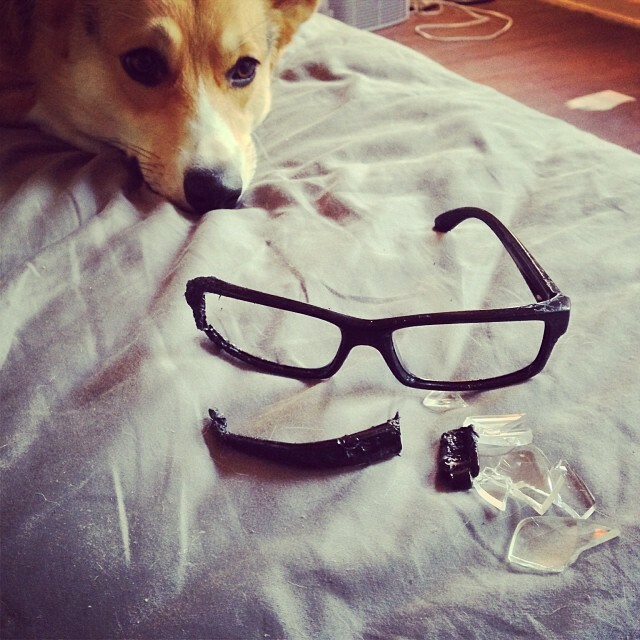 She ate his glasses. I mean. I MEAN! Amelia. Ugh. 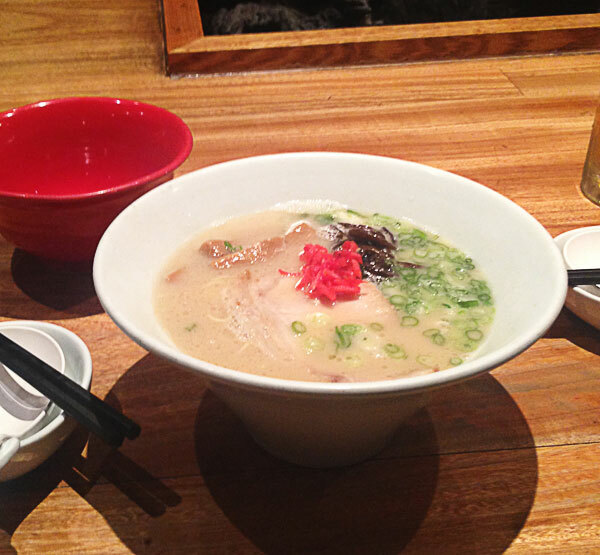 There was ramen at Ippudo. It was maybe some of the best ramen of my life. Keep in mind I’ve never been to Japan but this ramen is going to make it really hard for me to eat ramen in Los Angeles. The broth was cloudy, flavorful and thin. The noodles were totally perfect and the fried chicken! AHHH! Their fried chicken is bomb. There was a fancy modern dinner at The Elm. A few weeks ago I watched the documentary A Matter of Taste, which is all about Chef Paul Liebrandt’s journey through the New York chefing scene. I’m such a girl because if you somehow manage to make me emotionally invested and feel like I know you, I’ll want to eat the food you make. I love bagels and pastrami sandwiches and knishes. I headed to Russ and Daughters for an everything bagel with lox and cream cheese. 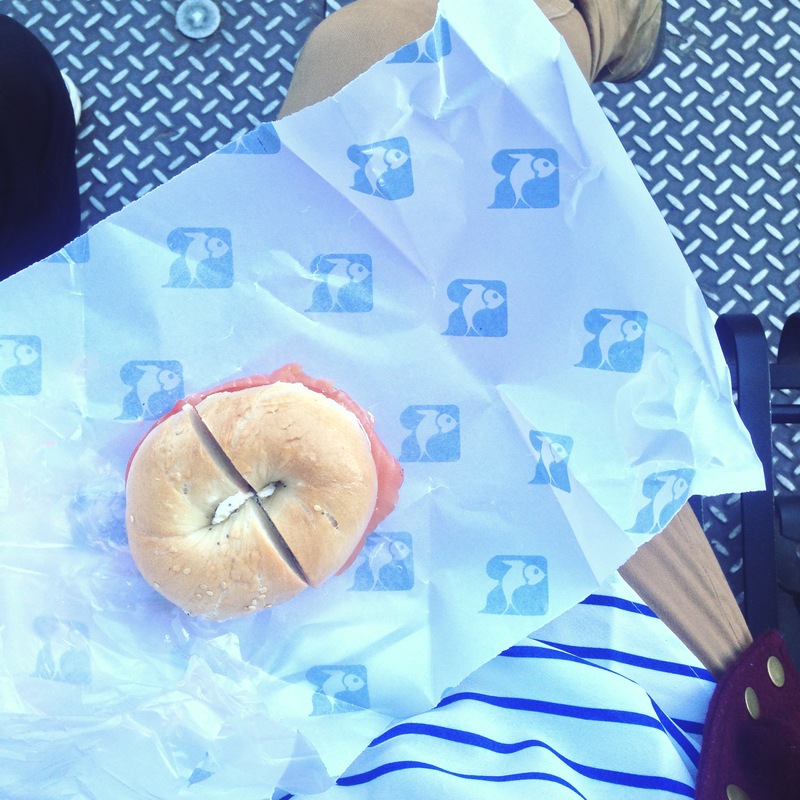 Who doesn’t get an everything bagel when you order a bagel?! Who are you! I want to understand you. I was also sort of excited that their paper matched my shirt. After so many meals out I wanted to eat at home in my pajamas. Josh and I went to The Meat Hook in Brooklyn to get a bunch of stuff to cook for our friends. We were staying with Josh’s brother Sean, and it was honestly sooo nice to be staying in an apartment versus a hotel. Josh bought a bunch of beautiful pork chops, some black garlic aioli, some pretty produce and I bought some cute pears to use for dessert. If I lived closeby, I’d be at Meathook all all the time. I’ve been such a fan girl of Four and Twenty Blackbird for a very, VERY long time. I mean, their salty honey pie inspired this ice cream and I just think what they do is dreamy. 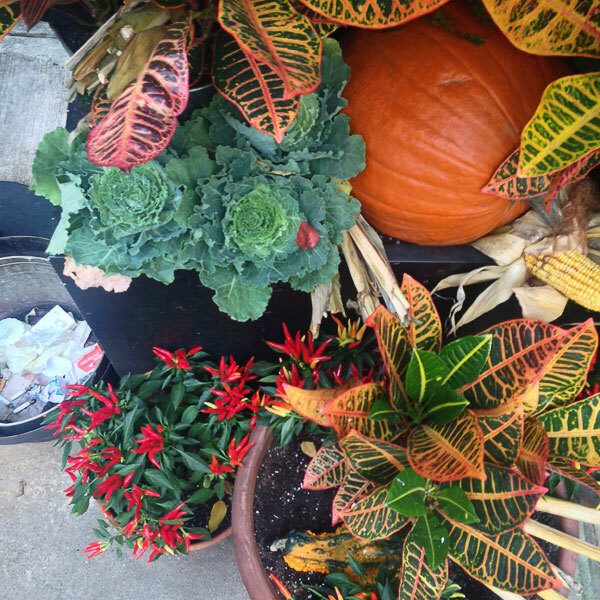 I hopped on the train and went to Carroll Gardens to visit their pie shop. The pies didn’t disappoint–maybe some of the best I’ve ever had. 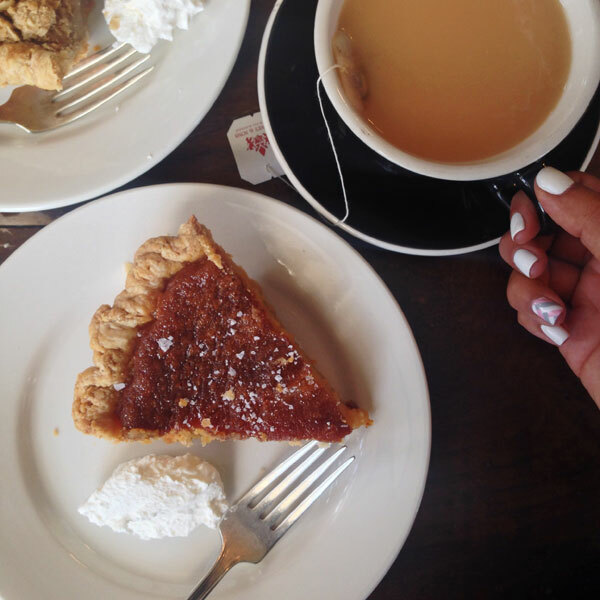 I drank tea and ate some pie and thought to myself, VACATION IS THE BEST! I miss New York already. Damn those doughnuts are fine! You had such a range of lovely meals in New york; eating vacations are the best aren’t they?. Who said new yorkers do not know how to have a good time? They clearly didn’t follow you around! Your trip sounds amazing! Naughty Amelia – my dogs managed to ruin a friends coffee table the last time they were babysat! We are off to Japan next month – wrmegerd ramen! Wow! 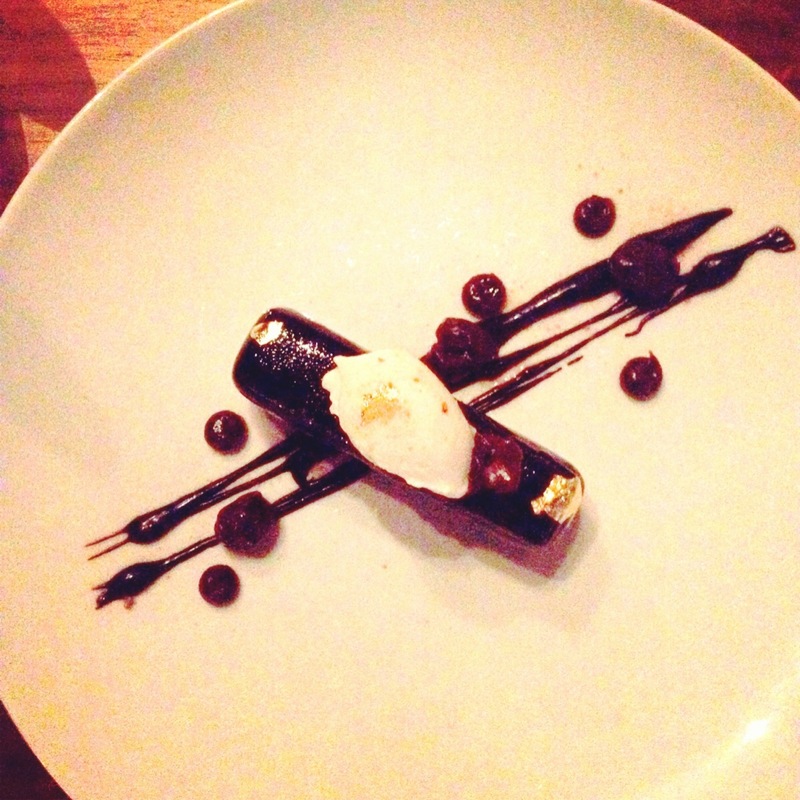 It truly looks like you had a great time tasting food and restaurants in New York! Thanks for this little “guide”! That is an awesome trip. Ya nailed it. PS. My fiance eats constantly (and everything) and sometimes even loses weight. It’s so obnoxious. I feel you. yay! nyc is the best 🙂 glad you enjoyed your trip here. yay! I’m SOOOO glad you made it to Paulie Gee’s. If you ever find yourself in NY and in need of a friendly dining/drinks partner, shoot me an email! YAY! Yes, I’ll email you next time. Would’ve loved that! So glad you enjoyed! Paulie Gee’s pizza is the best in Brooklyn, love it!!! M. Wells smoked salmon sandwich brings tears to my eyes………will have to check out Maison Premiere, looks lovely. Next time you have to EAT at ABC Kitchen inside the store! It’s the best. Whoa. Didn’t have their smoked salmon sandwich–wish I did now! Great post at a great time as I will be in NY next February. I will definitely go to some of the places you wrote down here. Last year we went on a Food Tour around NY and had a great time eating and walking and eating and walking. We also took part in a Pizza -making class. So food plays a Major role when visiting this great City. Thank you very much for the Infos. Oh yay! So glad you’re going to use it! Those couches and the people buying them totally kill me. I mean, what job do you do to make the money to consider such a couch? I love poking around there. Local note: there is a bathroom on the 2nd floor of ABC! Perfect before jetting over to Fish’s Eddy. I love NY too! Thx for sharing. Everything bagels are too damn salty! Wow! I mean, I live in NYC and you covered more territory – (and ate at places I only dream of) than I do in a year! How was the cereal milk ice cream? I have GOT to get there. soon. Haha. The cereal milk ice cream is awesome. You should definitely go! I have been living in NYC for almost 3 years and have not even heard of some these places! I am so excited to try them thank you so much for the guide! Dough makes my absolute favorite doughnuts ever! They have spoiled me for life. Also, Pearl’s lobster roll is phenomenal! I enjoyed reading this post so much! Oh my god, I want to eat all the food. I haven’t been to NYC yet, but I’m assured that I’ll come back broke and not hungry anymore. How can Amelia still look cute with broken glasses? Can’t dogs just look as evil as they truly are sometimes? Life would be so much easier. That’s exactly how I feel right now. I’ve been eating broth and vegetables for the past few days. Haha! When I was sent the picture I wasn’t even mad BECAUSE LOOK AT THAT FACE! You had some really good stuff on your trip! I always try to take pictures of every trip I take but I can never find the time (and sanity) to put the pictures together for a decent post. Have to go tackle my recent Melbourne one. Gah! 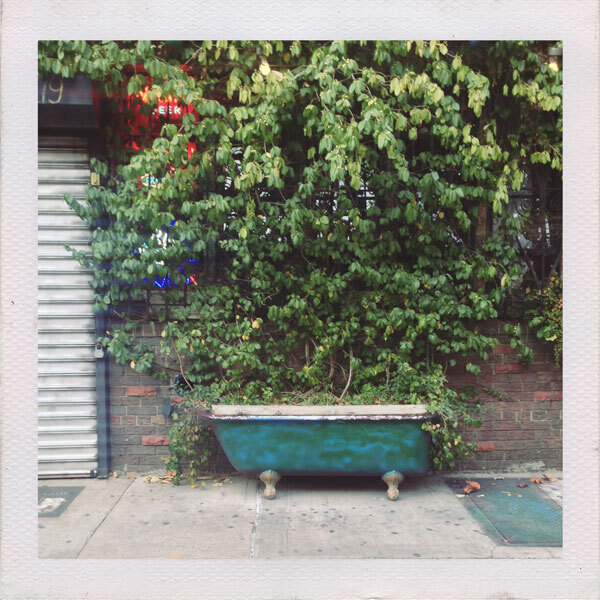 I lived in NYC for 8 years…I feel like I don’t know it anymore!!! I live in NYC and I’ve been to almost none of these places! Definitely bookmarking this for the next time we have no idea where to eat (which will be in like 2.2 hours because it’s always and then we go to the same 2 places we love!). Next time you’re here, try out lobster rolls at Luke’s Lobsters – they’re to die for! You’ve got the best nails on the ‘net… sounds like a great trip to NYC. 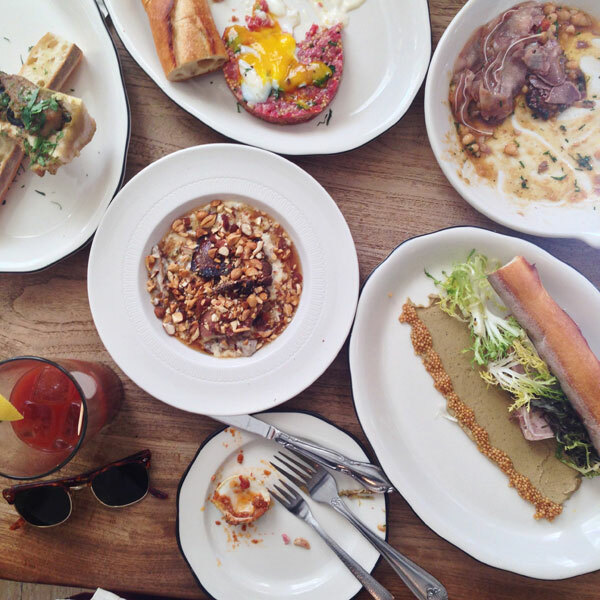 Here are some food related activities next time you’re in New York for fun. Hopefully it’s sooner rather than later. Oh my god. Everything here looks so delicious. 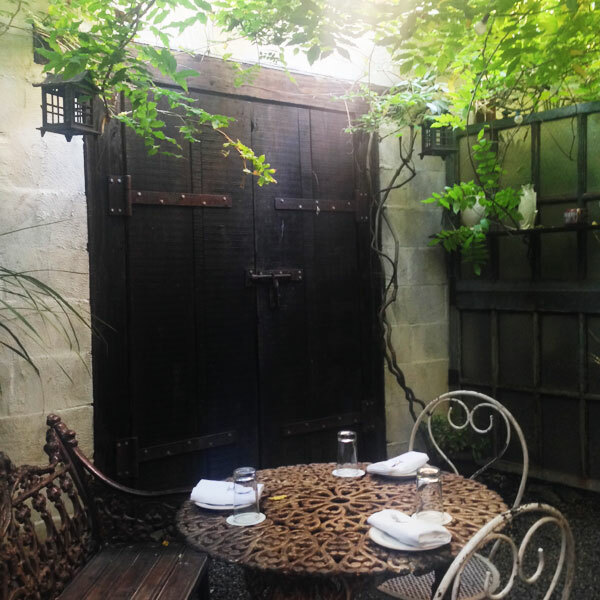 I am adding these places to my must-visit list the next time I’m in the city! I love, love, love New York. You pictures are all beautiful. This post was definitely one of my favorites! Wait, what? I missed something?